With so many people still experiencing cold weather through the month of March, we chose the tips of the evergreen trees - spruce, fir, and pine - as our featured herb of the month. To learn more about the medicinal properties of these plants, hop on over to Bek's blog. The tender young growth that emerges from the tips of the branches in the spring is ideal for making foods and medicine. 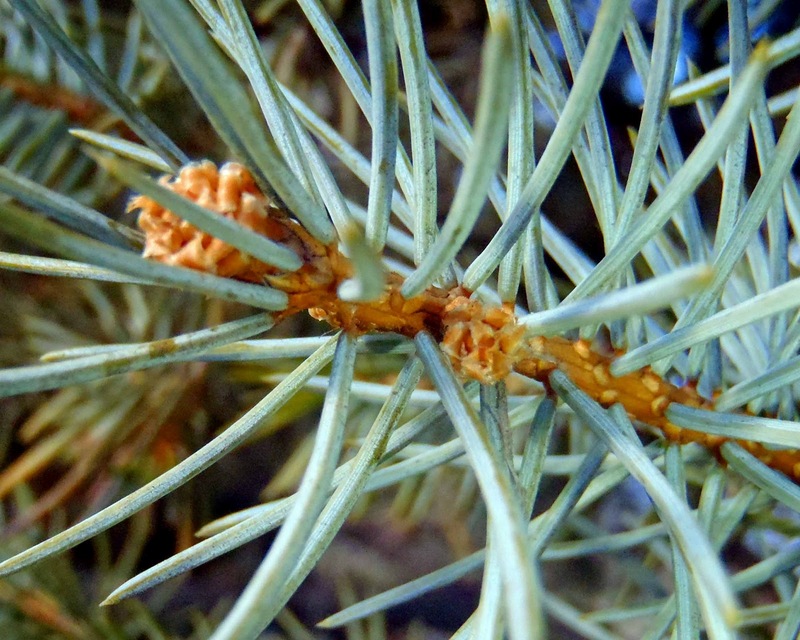 These young needles may even be enjoyed raw, in a salad. When the new growth of these soft green tips emerge in the spring, they can be spotted from a mile away because of their vibrant green color. But keep in mind that the older needles can also be utilized, but for recipes, these need to be chopped if consumed. Surprisingly, these coniferous needles don't just taste like xmas trees smell; they can also have complex citrus top notes - from orange to pomelo to grapefruit - and the taste varies widely from tree to tree. We are so excited to be using spruce/fir/pine as our featured ingredient. If you simply think of them as being pine-y, you are selling them short. They are zingy and refreshing and full of punch! As always with foraging, don't feel like you are obligated to walk barefoot in a majestic forest in order to collect good food (although this is quite fun!). You can obtain great forage in your backyard or the city, just be mindful of spraying and pollution. 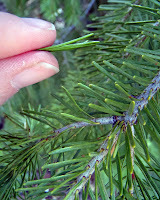 The needles of the spruce tree emerge from the branch singly in spirals, are four-sided (they have a diamond shape in cross-section), and can easily be rolled between your fingers. 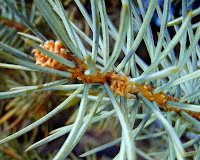 The needles of the fir tree emerge from the branch singly, often by what appears to be a tiny suction cup. 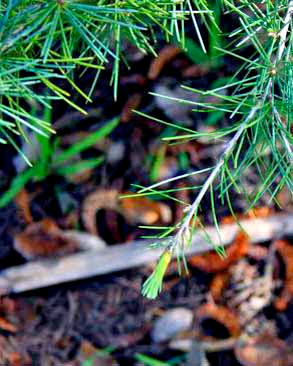 Fir needles are flat, and cannot be easily rolled between your fingers. It helps me to remember that fir are flat. 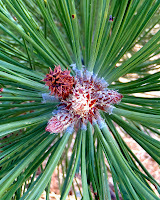 The needles of pine trees emerge from the branch in bundles of either 2,3, or 5, not singly. So, now that you know how to identify spruce, fir, and pine, are you ready to make some inspired dishes from your forage? I know I could go in about sixty different directions with this exciting ingredient, and can't wait to see what you all come up with. Let's get wild this month! I have blue spruce trees in both my front and back yards. The trees are enormous, and just love the climate here. So, it's a natural for me to use spruce for the Wild Things Round Up this month. I was really inspired by the citrus notes I could tastes in spruce, and decided to make a play on gremolata to create a bold sauce that always makes an amazing marinade. I served spruce gremolata over grilled deer steaks, but can imagine it being delicious accompaniment to any number of meats, and even mushrooms and vegetables. The flavor of spruce gremolata may be too strong for some as a sauce, but don't miss it's magic as a marinade. 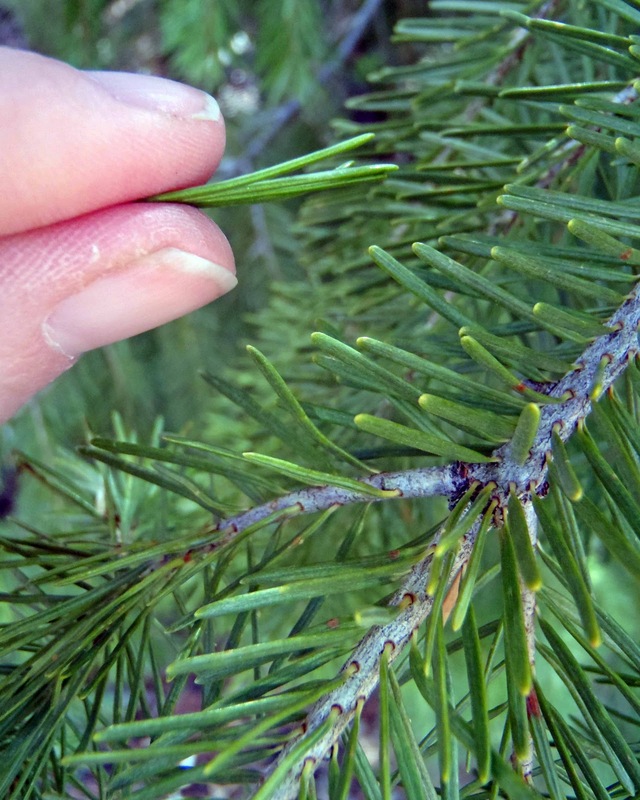 To make spruce gremolata, start by removing spruce needles from a branch. I found that this was easiest to do with a pair of scissors. Next, strip the zest off of an orange. Place the spruce needles and orange zest into a mortar and pestle along with a few scratches of garlic to taste (I can't take huge doses of raw garlic), and grind into a paste. Alternately, finely chop the combo with a good knife. Add some olive oil to loosen the mixture. To use as a marinade, spoon generously over meat, and massage it in. Leave to marinade from 1-24 hours. Before cooking, scrape excess marinade from meat, and generously season with salt and pepper. And if you enjoy strong flavors, finish your meat with a spoonful of raw spruce gremolata. I'm sharing this recipe and the Wild Things Round Up with the Hearth and Soul hop. I'm so exited, surely I'll find these!!! I'm game...but can I substitute Eastern Cedar? It's our only native evergreen locally. Jenny, could you please email me at wildthings.roundup@gmail.com ? Oh, this is really cool! 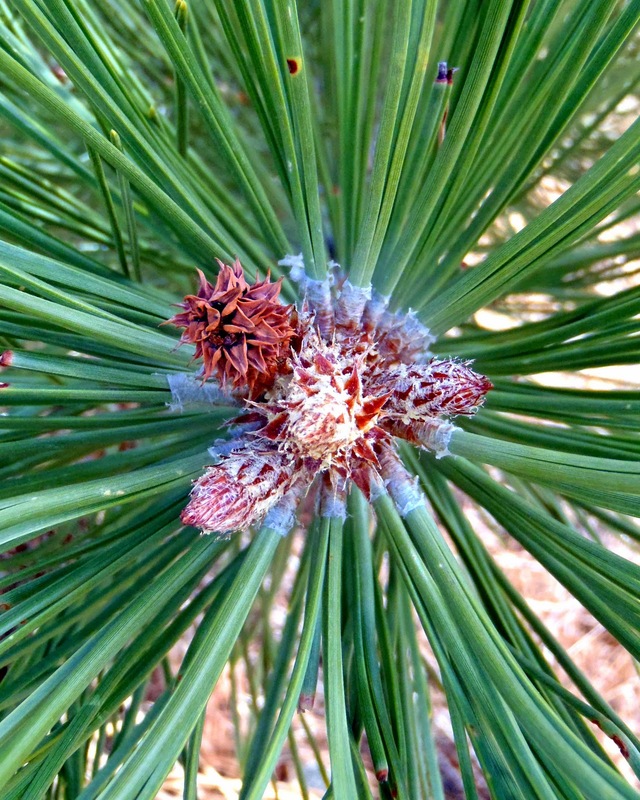 I didn't even realize you could use pine needles this way. Now I must hunt down some pine trees. This is new to me, how exciting there are lots of pine trees here. Now let us wait for Spring to show up. How exciting! What a fun idea for a round up. 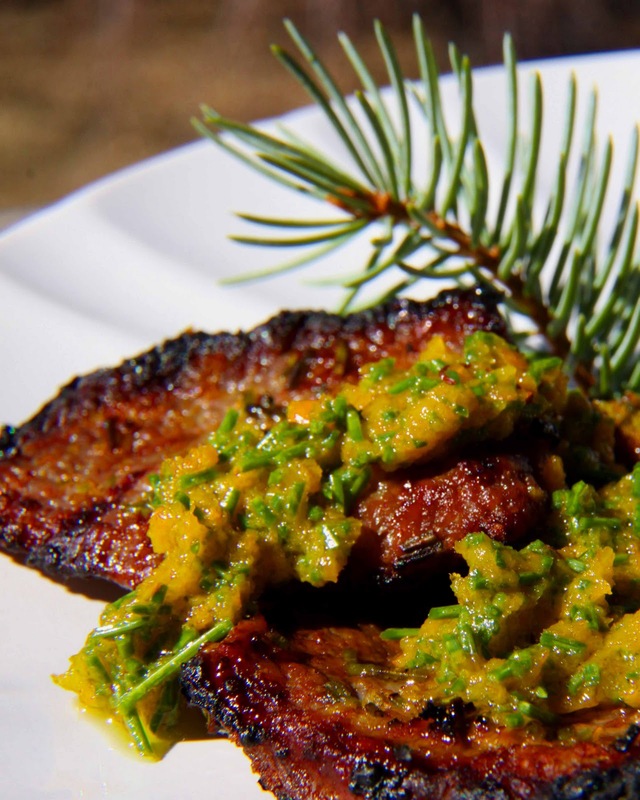 That spruce gremolata sounds delicious! PARTEEE TIMEEEE. I am SO excited about this month's challenge. I could hear the mowers coming and I was running out to the road screaming...stop I have to get the wild chives and take my pictures. They did, and I did...and now I have wild chives for my dish. I had so much fun! I wanted to share that with you. Thanks for always taking us on your adventures. I had absolutely no idea that you could eat spruce, fir and pine tips! Your gremolata sounds amazing. I could almost smell it when I was reading the recipe - wonderful. I always learn something when I visit you here! YEA!! Christmas trees I have! I can play this month - not sure what I will do with them - can you hear my kids from here "what are feeding us NOW Mom?? ?/" I am so glad you shared this with the Hearth and Soul Hop! You are the bomb dot com of hostesses! This blows my mind! I had no idea you could eat these. Your gremolata looks amazing. I'm definitely following along. Love this! Mz. Helen, that is too cute. You are a woman after my own heart (and such nice mowers!). Bek and I are getting really excited about this featured herb, and I can't wait to see the creativity it sparks in you all. Have fun! This looks amazing and is so inspiring! Now to try and find a spruce tree somewhere. I'm sure they are all over the place. I imagine spruce, pine and fir tips all have flavors distinct from one another? Yes, that's absolutely true. 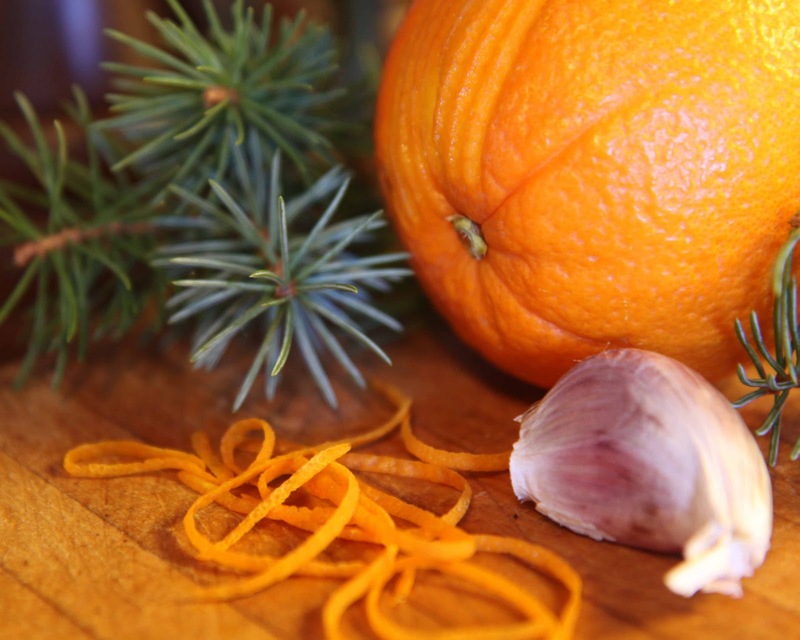 Of the plants I've tasted, spruce has the most citrus-type flavor. And fir tastes the most like you'd expect a xmas tree to smell. Pine falls somewhere in between. But I'm guessing that this all varies plant to plant as well. All the more reason to experiment and taste 'em all! I landed here (so happily!) after taking a long walk in the woods yesterday, snacking on fir tips and wondering what I could possibly use them for in the kitchen. I'll be heading out today with a jar to collect more and keeping tabs on the recipe challenge! Eeek! UDove - Isn't amazing how much food there is in the woods, once you know how to recognize it. Such a delight!